In game 3 of the 2015 NBA finals, LeBron James stole the ball a couple times from Stephen Curry late in the game as the Warriors were mounting a come-back. James had jumped into the passing lane and grabbed the steal on Curry's inbound pass - then LeBron was fouled immediately. 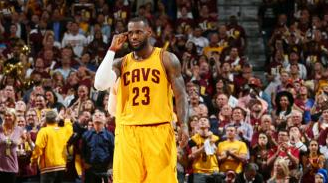 The Cavalier's small forward then pointed to his temple and subtly smiled on his run back up the court. Here James' interpretation of his own body language is of course accurate (e.g. "I know what you're thinking" or "I've got you figured-out") - although coupled with a different facial expression, such temple-pointing would have a completely different meaning (Can you describe some of these scenarios?). 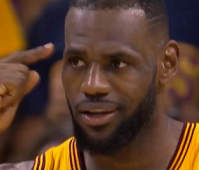 Perhaps LeBron had a tactic and this act was a form of trash talk - and yet, it would have been wiser to keep this advantage a secret (not unlike poker). Stephen Curry or his coaches would have probably figured it out eventually of course - however if perhaps James could get even one more steal out of his ability to read Curry - it could very well be a game-changer and a championship-maker.